Show your hands! Spread the word with these shirts that will get you noticed. People will want to know what a "concrete5" is. They'll ask if it's your band, and these days they'll still think you're cool when you admit it's web software. They cost $20 (including shipping*) and are made with 100% Cotton. Guys, women like a man in a bold color. These colors are beyond bright: Lime Ricky Green, Pushup-Pop Orange, Atomic Banana Yellow, and plain ol' Licorice Black. Ladies, your shirts come in Purplelicious, Forest Green, Sky Blue, and Rockstar Black. Got a whole bunch of friends? Running a local concrete5 meetup? Just wanna make your office mates happy? For $35 we will mail this grab bag of swag to anywhere in North America. Get 5 Stickers for FREE! 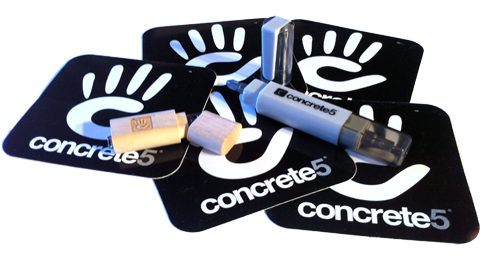 If you put a concrete5 sticker on something and send us a picture, you get an easy 500 Karma points. To make this even more appetizing right now we'll mail you a sticker for free. Just shoot us your mailing address. Like for a letter, not your email!